This'll be a short entry, but one I'm happy about. Remember my post about Eye of the Galaxy, a forthcoming Risus campaign worldbook? Well, if you're into play-by-post (or think you might be if you tried) click right here with your clicky implement. And if you happen to be in or near Fort Collins, I'll be running an Eye of the Galaxy session or two in the near future at ye locale shoppe. Keep an eye peeled. And if you've got any advice on good PbP? Boy howdy, my inbox is open! I'm gingerly dipping a toe into the Google Play environment, and more specifically, Risus: The Anything RPG is now available (free, of course) from Google Play Books. We're pretty much a Google household, so this fits into my own reading habits and may find Risus a few new eyes in the long run. Plus, when reading Risus in a web-browser, it has a kind of storybook look that tickles me. What I like most about it is that they store a PDF version and the free-flowing version together as a single entity, and you can easily switch between them if the book has both typeset and ePub source files, which Risus does. In the same menu where you'd change the font size, you can switch between "Flowing Text" view and "Original Pages" view. For titles without an ePub, like Uresia: Grave of Heaven, "Original Pages" is the only view (but now I'm more curious than ever about maybe adding a flowing version of Uresia someday ... it's a bit trickier for a book like that, since things like sidebars and price tables can feel jarring jammed into a linear text-flow). Google Play would never do as the primary channel for Cumberland Games, alas, due to limitations in the form. PDFs can't have layers or interactive elements, for instance (Uresia normally has removable borders and backgrounds, a clicky Index and so on, all of which vanish in the GPB version, which is actually a high-resolution raster) and it lacks the flexibility of the full "master version" of Risus with the multiple PDF variants and such. But ... it's still kind of nice (and Google Uresia is currently half the price of the regular version), so it's a pleasant side-dish, as it were. And this absolutely cements my decision to insure the forthcoming Risus Companion 2nd Ed releases with an an ePub version, which will be a benefit to those buying it through OBS or elsewhere, even if the Google Play option remains a curious side-show. So there's that. In the meantime, Risus is now available on another platform that may be newbie-friendly in ways the other formats can't touch. Got any thoughts on all this? My inbox is always open. Sandra and I went to see the new Hayley Atwell movie tonight, and it was very likeable despite needing more Hayley Atwell (and Kanga; Kanga got maybe two lines). The story goes note-for-note exactly how you'd expect from the trailer and/or the first 15 minutes of the film, which is fine ... it's not the sort of story that needs a lot of surprises, really. The performances (both traditional and digital) are very good, and the melancholy moments are effective. The line "Did you let me go?" buried me deeply. And now both Sandra and I are missing Agent Carter more than usual, and the usual is a lot. It's also got me thinking about color again. Not that I often stop. The palette of Christopher Robin is both warm and muted, which suits the film very well, but it also stands out, because in modern film, the fantastic (in the literal sense) usually likes to scream at you, visually, by being hyper-saturated, so you can't possibly fail to notice how fantastic it is because it's punching your eyeballs with impossible palettes. In modern CGI fantasy, it's apparently a sin for foliage to be green, for example: "fantasy" foliage is Tang orange and candy-grape purple and pulsing neon magenta. Which isn't what I personally fantasize about. 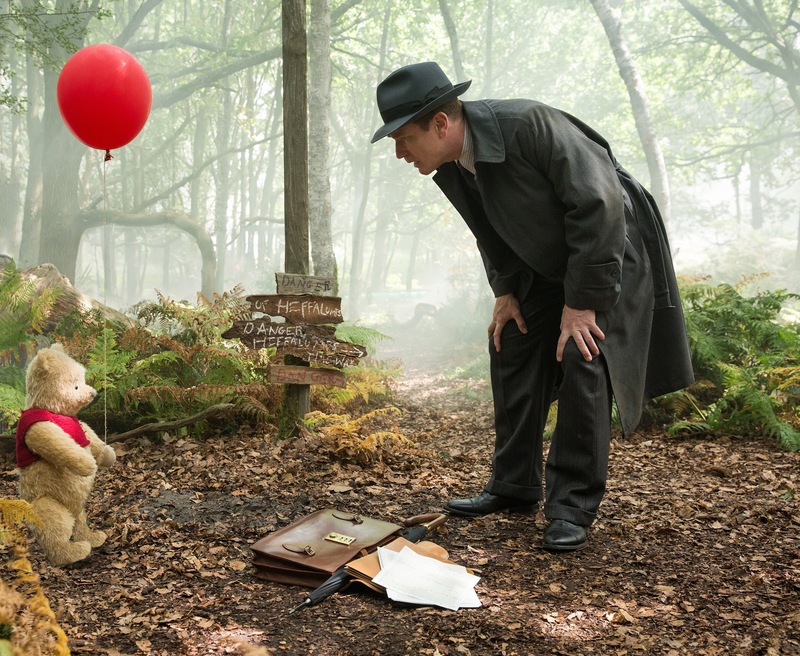 Different strokes and all, but the earthy-fantasy vibe of Christopher Robin made me very happy indeed. So did the balloon, which (against the film's grounded palette) could stand out, looking brilliant in ordinary, lovely red. Which just goes to show I can turn anything into an opportunity to gripe. Now where's my tail gone again?